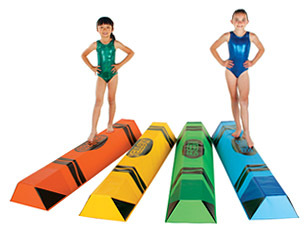 Gymnastics Equipment - Balance Beams - Fundamental Crayon Beams - Norbert's Athletic Products, Inc.
Norbert’s Fundamental Crayon Beams bright colors and fun Crayon design brings out the kid in all of us. Extremely stable, perfectly portable and forgivingly fun. Fundamental Crayon Beam is 6' long and 8" high with an 18" wide base tapering upwards to a 6" top working surface. Filled with solid layers of crosslink that will not break down and feel mushy like competitors versions filled with softer polyfoam. These beams are covered with the same extremely durable 18 oz. vinyl we use to make our Fundamental Beams and Mats.